Alberta Charney said she hasn’t heard much outrage from the business community over the state’s latest budget. The fiscal 2016 budget is no different. Gov. 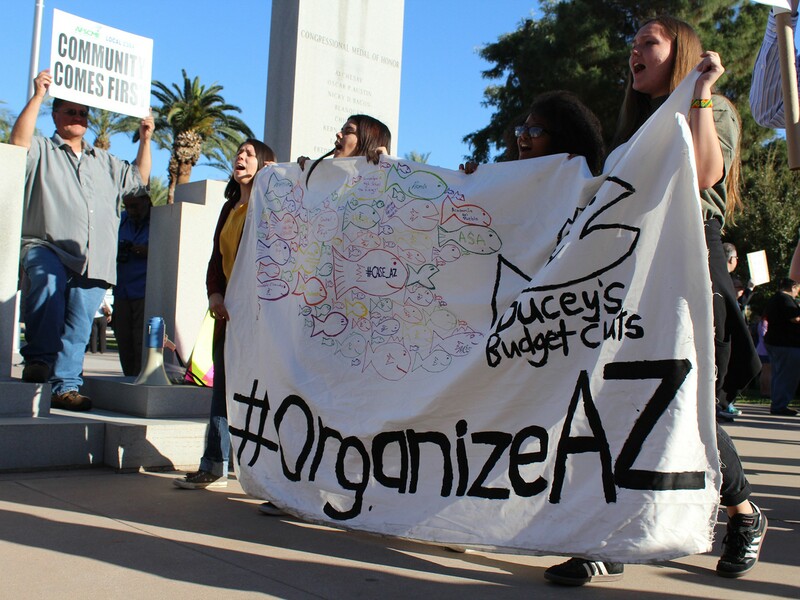 Doug Ducey in March signed a $9.1 billion budget that adds some funding, but also trims millions from higher education and social service programs. Business and economic experts said although they’re concerned about long-term implications on the state’s economy and job market, they also found some bright spots for the business community. 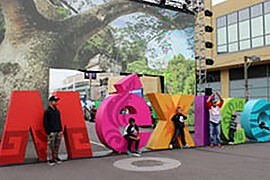 In 2014, the Arizona State Trade and Investment Office in Mexico opened to expand the state’s business presence across the border. State lawmakers included $300,000 to open the office in this year’s budget. And the state allocated the same amount to operate it for fiscal 2016, according to the Arizona Commerce Authority. Mexico is a growing world market and Arizona’s most important trading partner, according to the authority. In 2013, trade generated between Arizona and Mexico exceeded $14 billion, the group said. Allocating funds to keep this office during this budgetary time is a win, said Glenn Hamer, president and CEO of the Arizona Chamber of Commerce and Industry. However, Jim Rounds, a senior economist with consulting firm Elliott D. Pollack and Co., said it’s only a “win” if they’re successful in expanding business to Mexico. Members of the business community said they were happy to see the tax reform competitiveness package, signed into law in 2011, remain on schedule. This package includes phased-in reductions of the state’s corporate income tax down to 4.9 percent, among other reforms. The latest budget maintains the tax reforms the business community advocated for a few years ago, Hamer said. He said other investments may yield more than tax reform. For business to remain competitive, the state needs to reduce the tax burden, said Dennis Hoffman, an economic expert at the W. P. Carey School of Business at Arizona State University. Additionally, Ducey added indexing to income-tax brackets to account for inflation. Small business will benefit from millions in income that’s protected from being taxed at higher rates, Hamer said. The state halted initial plans to cut $4.5 million from the Arizona Office of Tourism. 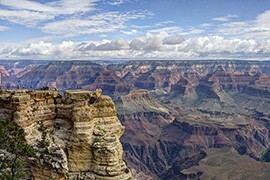 Tourism is the state’s third-largest export industry and one of the largest state revenue generators, according to the Arizona Office Of Tourism. “It’s a win, in this budgetary environment, to be able to preserve the budget of an agency so integral to the success of one of Arizona’s base industries is a very positive outcome,” Hamer said. 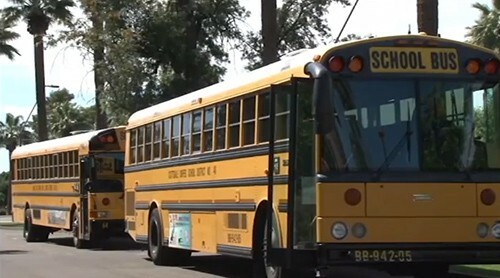 But, officials said, the budget still leaves the state short changed compared to neighboring states. 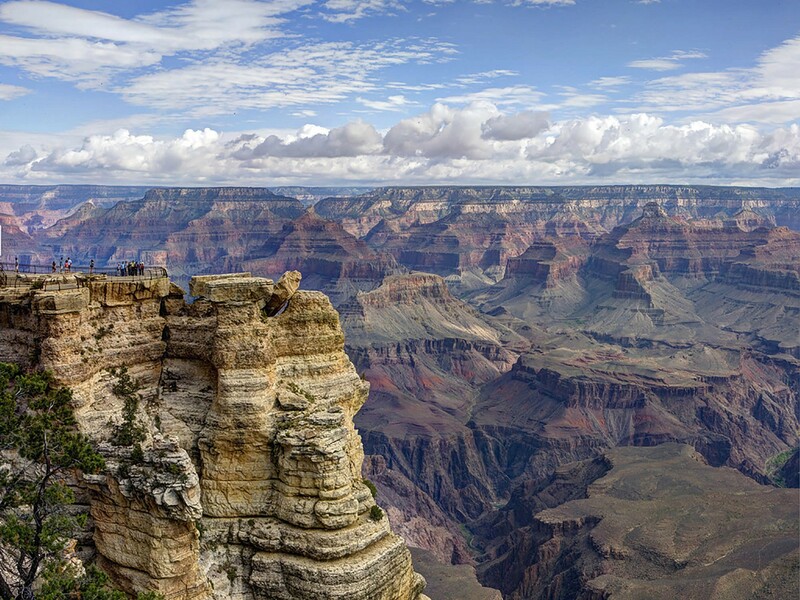 Arizona has a $13.5 million tourism budget for fiscal 2016, while California’s is $100 million. The budget includes deep cuts for the state’s three universities: $99 million, a 13 percent cut. “Some states are well endowed with college-educated people in the workforce and may not need to invest as much in their universities. That is not true of Arizona,” Hoffman said. Experts agree that the larger share of college graduates in the labor force, the more prosperous the economy. As the world becomes more technologically advanced, skilled workers are imperative and it is “important to maintain a world class university system,” Hamer said. Arizona business may have to look out of state to find skilled workers, which could increase search costs to find quality workers, said Daniel Herder, an Arizona State University student and president of the student economics association. “It could, in fact, cause a bit of flight,” Herder said about people who must move out of state to find opportunities. Rounds agreed that higher education funding is an important business concern. However, he said that in this current economy, lawmakers needed to make cuts. He said he does not believe cuts to universities are permanent. Hamer said that going forward, there is a consensus among experts that Arizona needs to put more resources into universities to keep Arizona businesses competitive. Lawmakers voted to cut reimbursement by 5 percent to health care providers and ambulance services that serve Medicaid patients. “We didn’t see wins in this budget at all,” said Greg Vigdor, president and CEO of the Arizona Hospital and Healthcare Association. 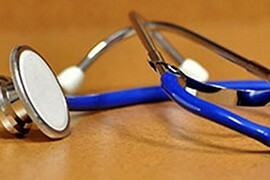 Critics said the cut could cause long-term damage to the health care industry, one of the state’s more vibrant economic sectors. The major factor for these losses is underpayment by government payers, particularly the state’s Medicaid program, the Arizona Health Care Containment System, according to the association. The association predicts the repercussions in the health care industry are much larger than the savings. “We are finally reaching the point with hospitals that it is too much of a hit,” Vigdor said. Vigdor said cuts to the health care industry threaten hospitals’ ability to provide certain services and keep their doors open. Since 2012, two rural hospitals in Arizona have shut down, according to the association. The fiscal 2016 state budget has universities grappling with nearly $100 million in funding cuts. One expert says it's a reduced investment that could harm the state in the long run. 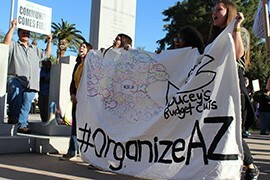 Students demonstrate against cuts to education funding on March 5, 2015, outside the State Capitol. One health care expert said he worries the 5 percent reimbursement cut to health care providers and ambulance services that serve Medicaid may cause long-term damage to the industry. The state halted initial plans to cut $4.5 million from the Arizona Office of Tourism. The state allocated money to operate the Arizona State Trade and Investment Office in Mexico for fiscal 2016.